Last year’s Fast Ideas segment was won by Oliver Damian, who came up with the notion of rewarding people on the basis of what they contribute to society, not how much money they accumulate. Here, we talk to him about what’s been happening since his 30 seconds in the sun. He also shares his tips for anyone unsure about putting their Fast Idea forward this year. I am currently a student of design – it’s actually a double Bachelor of design, and creative intelligence and innovation. It cuts across faculties so I’ll be studying with people from all different areas. The focus is on innovation and creative intelligence. What do you plan to do with your double degree? I want to be a designer in an innovation space. The course is all about solving problems which brings me back to TEDx space: people trying to solve the difficult problems we have – ideas that are worth spreading. What inspired you to submit your Fast Idea last year? I try to really live the idea of being ‘anti fragile’, meaning, you plant a lot of seeds. “What’s the worst thing that can happen if I do this? Nothing! So they don’t pick it. What is the cost to me? 10 minutes of my time!” So I did that. I do a lot of those things. I try stuff. I experiment. If an experiment won’t kill me or result in a catastrophic event…I’m willing to try it. So when I saw the email from TEDxSydney, I decided to just go for it! What was your Fast Idea, in a nutshell? What was/is your personal connection to this idea? The idea came about because of what happened with the global financial crisis. The bank people – I don’t know what value they create yet they get all this money and then if they fail, society has to bail them out. That is stupid. They take the risks but they get all the bonuses. If the risks fail, we bail them out. They are taking so much value out of society and I don’t know what they create. Is there anything in your upbringing that instilled in you to not value financial wealth, to value community and relationships? Yeah, I mean… don’t get me wrong. I think lack of money is bad. My grandparents were always arguing about money. I value money because of the freedom it gives me to do things. But I certainly wouldn’t accumulate money just for the sake of accumulating it. How did you prepare in advance for the big day on the stage? I rehearsed! It was said that I didn’t look nervous. What you need to do is practical stuff. Just write down what you are going to say down – and practice it! 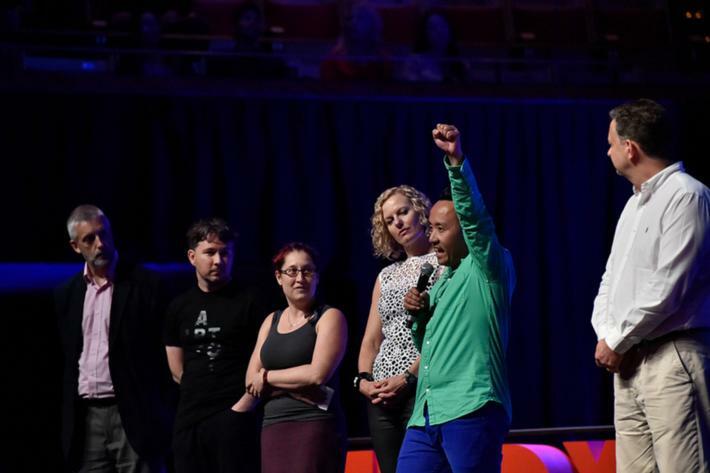 What do you feel you learned or gained from the experience of TEDxSydney? For the people who might have an idea but who think it’s not good enough, or wonder why anyone would want to hear it: When you put it out there, you have you have no idea who it will resonate with. So what if you say it and no one likes it? You’ve lost nothing! But let’s say people really got inspired and they do good stuff? That’s a huge win for a little investment! And it’s a great experience. It will change you! I’ve never spoken to so many people like I did in the Opera House that day. And I was invited to become a fellow of the RSA [Royal Society for the encouragement of Arts, Manufactures and Commerce] as a result. Any tips for people who might have a good idea but feel nervous? Treat it as an experiment! That’s what I did. Do the calculation. What is the worst thing that can happen? That is what I ask people when they are scared of doing something. What’s the worst thing that can happen – and if it happens, are you happy with that? Then why the hell don’t you just do it? A tip I got from Nassim Taleb is that when opportunity knocks – drop everything and go for it because you might not ever get it again.